It is ever-so easy to get stuck in this cycle. It can start with tension or pain and lead on to stress or it can start with stress and lead to pain. 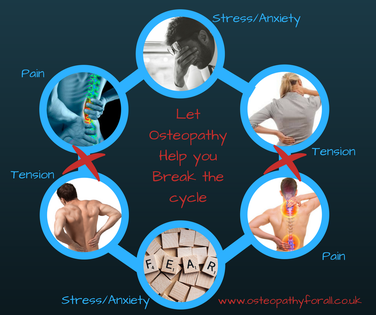 At Osteopathy For All we take into consideration all aspects of your story, physical and lifestyle, past and present to find the cause of your pain and then treat and manage it accordingly. So many of our patients remark on how much more comfortable they feel physically but also about feeling more well in themselves generally after their treatment. If you would like more information or would like to feel better then do contact us.